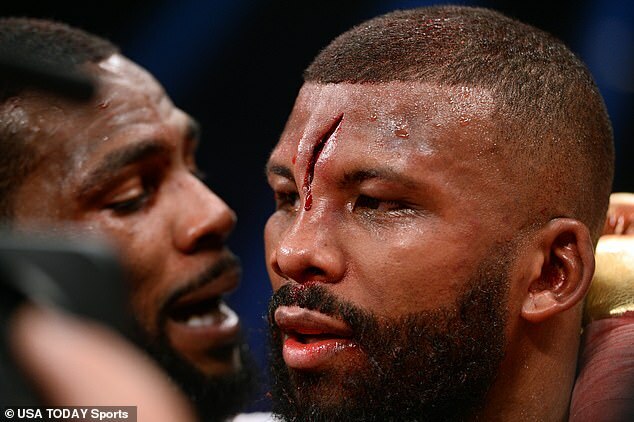 Marcus Browne examines the cut on Badou Jack's forehead after their bloody 12-round fight. New York’s Marcus Browne 23-0 (16) claimed the spurious interim WBA light heavyweight title with a 12-round unanimous decision win over a bloodied Badou Jack 22-2 (13) at the MGM Grand in Las Vegas, Nevada on Saturday night. In the co-feature to the Manny Pacquiao versus Adrien Broner bout, undefeated southpaw Browne came on strong in the second half of the fight after an unintentional clash of heads opened up a gruesome vertical cut on Jack’s forehead that bled profusely throughout the fight. At the end of 12-rounds Browne was awarded the victory by scores of 119-108, 117-110 and 116-111. The 2012 Olympian claimed the cut, which left Jack’s face a mask of blood and drenched referee Tony Weeks’ shirt, had no impact on the result of the fight. Former WBC super middleweight and WBA light heavyweight champion Jack, 35, was the favourite coming in to the fight. The Swedish fighter who is based out of Las Vegas credited Browne for the win. “I was flat. I don’t know what it was, but no excuses. I would love the rematch. Now I have to rest, get the head fixed and hopefully get that chance in the future,” Jack said. According to punch statistics Browne was the more active fighter, throwing 515 total punches to 303 for Jack. Browne also trumped Jack in the power punch department with 103 connects to 58. Browne called out WBC champion Oleksandr Gvozdyk after the fight. “He thought he was going to take me to deep water and drown me, but I was in shape,” he said. “Teddy Atlas, you think you have the best light heavyweight? Gvozdyk, let’s go.